Hemlock Falls in South Mountain Reservation. Some days when you’re hiking, the goal is to cover as much ground as possible, as quickly as possible. Other days, you just want to find a certain spot out on the trail and linger for a while. And a few weekends ago, it was one of those lingering days when I was out for a romp in South Mountain Reservation here in northern New Jersey. On this particular day, I had someplace else I needed to be later on. So instead of going in for a full-blown loop hike like I usually do when I’m at South Mountain, I decided just to do a short out-and-back to Hemlock Falls. 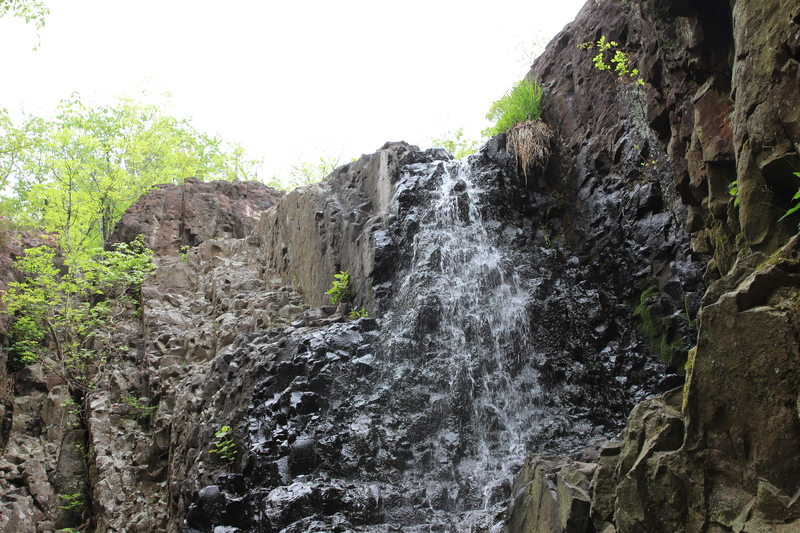 The falls – and a nice clearing with some benches set up – are along the yellow-blazed Lenape Trail in the center of the reservation, not far from where the boundaries of West Orange, Millburn and Maplewood come together. The falls are fed by one of the branches of the Rahway River – in this part of the reservation, the river’s more like a brook. I’d actually been meaning to go down to the Millburn end of the reservation and check out the Maple Falls Cascade and the Pingry Trail, but I found that Cherry Lane, the most direct route down there from Pleasant Valley Way and all parts north, was blocked at South Orange Avenue because of road work. (I could also have hiked down there via the Lenape Trail, but like I said, I was on a time limit.) So I made a quick judgment call and decided to check out the center of the reservation. The Lenape Trail leads into the woods right from the Tulip Springs parking area. From there it was a walk up a small hill, through the Pine Grove and over the South Orange Avenue footbridge. Once you’ve crossed the bridge, you keep following the LT south to a trail junction (near the white-blazed Rahway Trail) and hang a left. The trail heads south past a footbridge crossing the brook, and curves to the right past a smaller waterfall with a bench. Keep following the LT for a bit, and there will be Hemlock Falls and the benches. The overlook above the falls, accessed via the red-blazed Falls Overlook Trail. The waterfalls in the reservation are at their strongest after a good solid rain, but on the day I visited, there was a good moderate trickle splashing down over the rocks and into the shallow pool below. 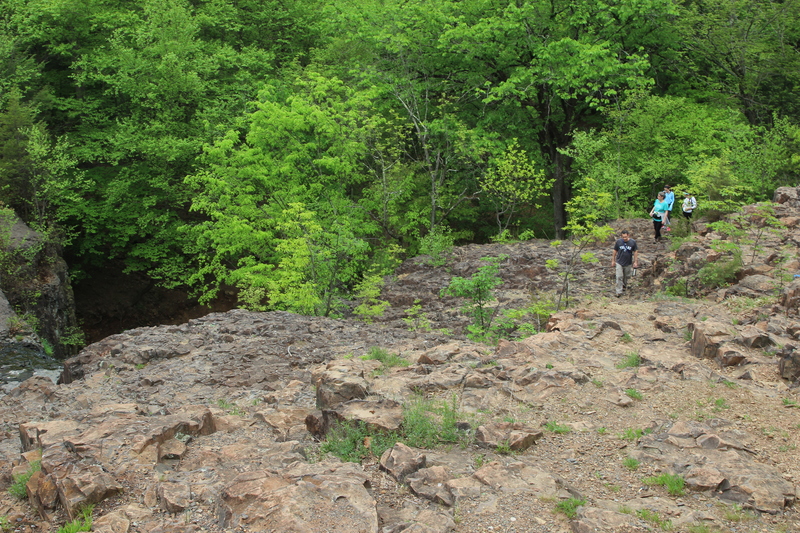 The red-blazed Falls Overlook trail – apparently a new addition to the trail system in the reservation, since the older maps don’t include it – takes you up a flight of stone stairs and up onto an asphalt path overlooking the rocks and the stream and pools that feed into the falls. The falls are a good place to stop, either as a destination or an extended break on a longer hike. I easily spent at least an hour taking pictures, sketching a rough map of the area, chatting with other hikers – there were quite a few families with kids and dogs out that day – and climbing up to the overlooks above the falls. I was relieved to see, by the way, that my rock-climbing skills were still in good form even after a long winter. Maple Falls will have to wait for another visit – stay tuned!